Where are the positrons coming from? 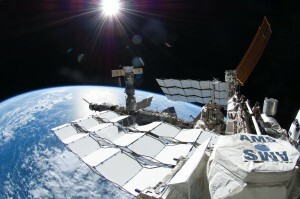 In this astrobite, we discuss the recent result of the AMS-02 experiment, a particle detector on-board the International Space Station that has measured an excess in the fraction of high-energy positrons (the electron’s antiparticle) coming from cosmic rays when compared to the expected fraction due to known phenomena. The AMS-02 experiment detects cosmic rays, photons and charged particles with very high energies that arrive at our Solar System. Among those particles, a tiny fraction are electrons and positrons. Positrons are an example of antimatter: for every particle, there exists a corresponding antiparticle, with the same mass but opposite charge and spin. We think cosmic rays are produced in supernova remnants and travel through the Galaxy to us. Along the way, they might interact with the interstellar medium gas, producing other charged particles that we also detect. AMS on-board the International Space Station, where it started taking data on May 2011. Credit: NASA. To distinguish among the different particles that make up the cosmic rays, the experimental device consists, firstly, of a magnet to separate particles from antiparticles. The magnetic field bends the trajectories of the particles and antiparticles differently because they have opposite charges. The most important part of the experiment is a device called the silicon tracker, which measures the trajectory of the particle, determining its charge, its incoming direction and its momentum. From these measurements, cosmic rays can be distinguished from particles that are simply roaming the Earth’s magnetic field. In this set-up, it is very important to distinguish between positrons and protons, since protons are far more abundant and can be easily mistaken for positrons when both particles travel at relativistic velocities. Two devices are in charge of performing the distinction. In one of them, positrons and electrons produce X-rays while protons do not. There is furthermore a second device, where positrons produce a distinct shower of particles, very different from incoming protons. This also allows for measuring the particle energy. AMS-02 has measured the fraction of positrons with respect to the total number of positrons and electrons as a function of their energy. Their results are shown in the figure below. Similar measurements had been undertaken by PAMELA and Fermi-LAT, for example, also shown in the figure. AMS-02 has confirmed the results from these previous experiments to higher precision. The most interesting feature in this figure is the increase in the fraction of positrons above 10 GeV. The positron fraction reported by AMS-02 as a function of energy (in red). Results from previous experiments are also shown. Credit: AMS collaboration. The overall cosmic ray energy spectrum decays with energy. There are much fewer cosmic rays with high energy than with low energy. 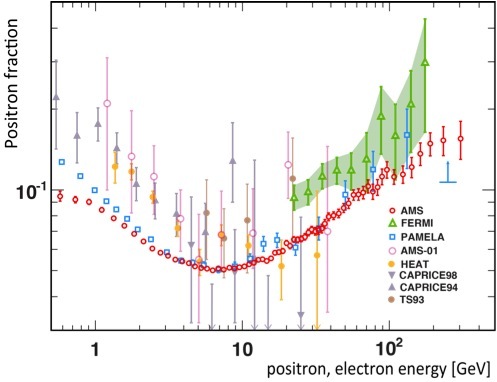 As a result, if all positrons had the same origin as all other cosmic rays, they should follow a similar behaviour, with an energy spectrum at least as steep as the cosmic ray energy spectrum. We see in the figure that this is not the case: while the positron energy spectrum decays at low energy, the behaviour is the opposite above 10 GeV. Hence, there must be other physical mechanisms producing these high energy positrons. Where could the excess of positrons come from? One possible explanation is that the positrons are coming from pulsars. A pulsar is a rotating neutron star with a very intense magnetic field. Electrons torn from the surface of the star are accelerated when their trajectories are bent by the strong magnetic field and they can give rise to very high energy photons that can in turn produce electron-positron pairs through a process called pair production. Another possibility is the production of positrons by microquasars. These objects are a type of X-ray binary systems where a compact object accretes matter from a companion and where particles are ejected through a relativistic jet. There is observational evidence that the jets of microquasars could contain electron-positron pairs. These pairs would be produced in the highly energetic accretion disk and channelled out through the relativistic jet. These astrophysical explanations are disfavoured by the observed isotropy in the positron fraction. The positrons are not coming from a particular direction on the sky. An exciting possibility is that the excess positrons is caused by the annihilation of dark matter particles or their decay from an excited state. (We discussed dark matter annihilation recently on this astrobite.) Although it is too soon to attribute the excess of positrons in the AMS-02 results to dark matter, there is no doubt a thorough exploration of possible physical scenarios is necessary to explain these puzzling results. AMS-02 will continue taking data and extending the energy range of the measurement of the fraction of positrons. This will help distinguish between the different scenarios. If you want to learn more on this topic, this is a nice article reviewing the AMS results and you can find additional information on the PAMELA website as well. For an account of the different processes that could produce positrons in our Galaxy, you can refer to this work. 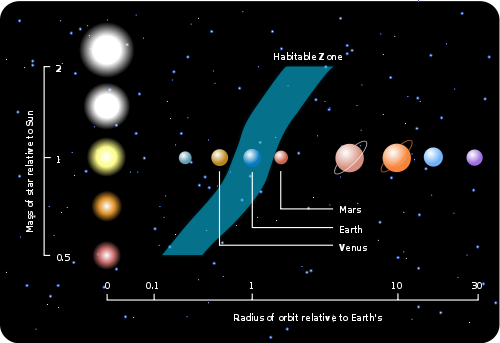 Dark Matter and Planet Habitability OGLEing MACHOs The search for WIMP annihilation in the Sun Closing in on Dark Matter?